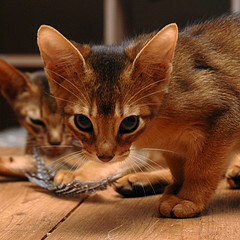 The Abyssinian Cat is accepted for show in Ruddy, Red, Blue, Fawn colors though it does manifest in many other variations. Grooming of the Abby is best left to the cat itself. Occasional bathing only if dirtied, and petting are usually grooming enough. Abyssinians are very curious and active beings. They love to play games, and are super smart and able to adapt to new games and conditions easily. Friendly to the whole family and protective toward small children this is the perfect cat for families. According to the CFA, the ideal Abyssinian isa colorful cat with a distinctly ticked coat, medium in size and regalin appearance. 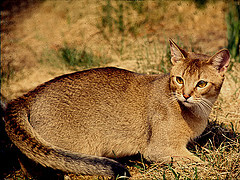 The Abyssinian is lithe, hard and muscular, showingeager activity and a lively interest in all surroundings. As described in the Abyssinian Breeders International "Kitten Buyer's Guide" by Carolyn Osier, "Abyssinians must be one of the most intelligent animals ever created." This handbook for the potential Aby owner describes these cats as "...a very people-oriented cat. Not a lap cat... but a cat that likes to be with people, a cat that wants to know what you are doing - that wants to help. There is probably no breed anywhere more loyal than the Aby. Once you have acquired an Aby as a companion, you will never be able to complain that no one understands you. Abys are very good at training people to do just what they want them to do."